I know I just wrote a post about teacher shoes, but I’m doing it again because this is a very important topic! Like, we should have professional development days dedicated to effective educator footwear. I’d show up for that. And these are my actual favorite teacher shoes. Ever. I’ve been wearing Toms ever since I started running after school programs seven years ago. I wore a pair of grey wedges (similar) every single day with jeans and my YMCA t-shirt and they were perfectly comfortable even during activities and games. I wore a black pair (similar) nearly every day during my first year of teaching, and I’ve owned two pairs of the strappy version as well. All together I’ve had about seven pairs of Toms, but I’ve actually never owned the classic alpargatas (I had to look up the official term!). They are so comfortable that I rarely feel the need to venture out to other brands. I went on the Toms website to look for another pair of the black wedges that I loved so much, but I was drawn in by these black leather heeled sandals. They sold out a couple of times while I was trying to decide whether or not to order them, so the next time they were in stock I jumped at my opportunity! I’m sorry to report that at the time I am publishing this they are sold out again. This pair is similar, and I’m considering getting them in another color. For me, wedges and shoes with a block heel are more comfortable than flats. I also love that they give me a little bit of height, and they make me feel slightly more dressed up. The ones here are particularly comfortable since the leather forms so well to my foot, and the open toe ensures that there is no rubbing or pinching. Today I wore them all day while teaching and then taking care of Jenson and I didn’t even remember to take them off until about 7pm. Twelve hours in and they were still feeling great. You are probably already familiar with the Toms mission to give away a pair of shoes for every pair sold. They also provide vision services, access to clean water, safer birth resources, and they donate to causes to prevent bullying. Production-wise, they produce one-third of their shoes in the regions where they give them. They have factories in Ethiopia, Kenya and India, and they also employ and equal ratio of men to women. I’m happy to incorporate their products into my increasingly ethical and sustainable wardrobe. These black heeled sandals are hereby declared my official teacher shoes of the 2017-18 school year. What are yours? On Thursdays my day is extra long because I teach piano and voice lessons after school. I have had the same music students for about eight years and I love them to pieces, so I really don’t mind. But I try to plan ahead and make sure I’ll be comfortable enough to focus on each one of my students, even into the evening. 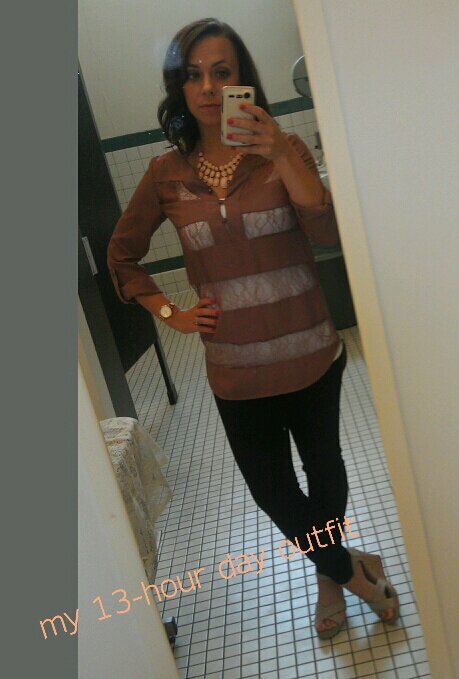 Today I went with my go-to tunic and skinnies from Target and my TOMS wedges (love those). My super awesome husband gave me the rose gold Fossil watch for Christmas last year, and I the necklace is from Forever 21. Oh! And I have about 12 of those white camis from Tilly’s and I wear them literally every single day. I can’t stand camis with built-in bras, so these are great because they’re just simple and stretchy and one size fits all. They do pill and lose their stretch if you dry them though, so just wash and lay flat to dry. I throw a few out from time and time and replace them for $10 each. That seems a little high to me for a cami, but they’re like a second skin to me; I can’t NOT wear one! I usually go with white, but I have grey, black, hot pink and mint green too, just in case I want to spice it up a little. Best perk: they’re long enough to cover the top of my bum, so I can bend over to help a student without causing an uncomfortable scene. Do you have any pieces of clothing you just can’t live without?